Unit 5: Energy: Where we get it and how we use it. Unit 8: Where Is Earth In Space? LESSON 13: Heat and Pressure in the Atmosphere. SWBAT 1) describe the relationship between the Celsius and Kelvin temperature scales; 2) explain the concept of absolute zero; and 3) describe the motion of gas molecules according to the kinetic theory of gases. 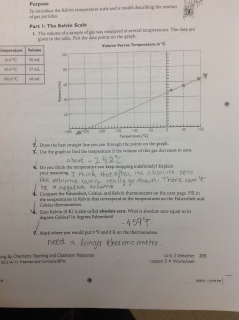 Students build on their understanding of measuring heat with this investigation into what we mean by absolute zero. Develop a model that predicts and describes changes in particle motion, temperature, and state of a pure substance when thermal energy is added or removed. Apply Newton's Third Law to design a solution to a problem involving the motion of two colliding objects. Construct and interpret graphical displays of data to describe the relationships of kinetic energy to the mass of an object and to the speed of an object. In this teacher led activity, students explore the relationship between temperature and the behavior of gas molecules. 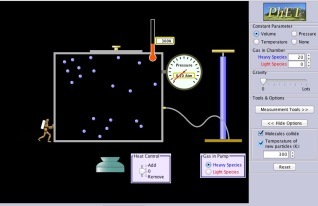 The computer-based simulation, help students visualize the movement of molecules at different temperatures, which they will later explore in another lesson on gas laws. I like to stress to my students the importance of understanding both the Fahrenheit, Celsius, and Kelvin temperature scales. As we study more about meteorology and later astronomy the Kelvin scale will continue to appear in the textbook and in our studies. Navigating between these three temperature scales can be very confusing to students. At this point some of your students may have heard about absolute zero. But few may understand what that means. This lesson is a nice introduction to the concept of absolute zero and a bridge from prior learning to understanding gas laws. Note: You may opt to have students explore the computer simulation by woking in pairs on a computer. Since the software is fun to "play" with, I wait to let them work directly with it at this point in order to move quickly through this lesson. **This lesson is adapted from Living By Chemistry, W. H. Freeman and Company/BFW, 2012. Science and Engineering Practice 2 Developing and Using Models Modeling in 6–8 builds on K–5 and progresses to developing, using and revising models to describe, test, and predict more abstract phenomena and design systems. Develop a model to predict and/or describe phenomena. Cause and effect relationships may be used to predict phenomena in natural or designed systems. Structures can be designed to serve particular functions by taking into account properties of different materials, and how materials can be shaped and used. As the students enter the room, have the following questions displayed on the board or projected for them to answer. What happens to the movement of molecules as the heat? As they cool? What is the coldest temperature a substance can reach? Explain your thinking. Is it possible for matter to have zero volume? Explain. Give students five or six minutes to answer these questions in their journals. When you are ready, have them turn and share their ideas to their table groups. This should take three or four more minutes. Call the class back together and then have a representative from each table share out that group’s ideas. This is a good time to review prior learning. Concepts such as the definition of temperature and heat should be reviewed again. If you have saved the class definition of heat and temperature from a previous activity pull it out now and display for the class. If you have student responses for the second question (what is the coldest temperature) that include absolute zero, ask them to explain what they mean by absolute zero. It is not necessary at this time to correct any incorrect definitions simply to listen to their ideas. You may find that a number of your students have heard of this but have yet to grasp what is meant by "absolute zero." For the last question (is it possible for matter to have zero volume) push student thinking towards the definition of density as well as the properties of matter this will help to set the stage for them to make the connection between the need for the Kelvin Scale and absolute zero with zero volume. In the first part of this activity students plot temperature data on a graph and then estimate the temperature of the gas if the volume reaches zero. I find students struggle a bit with plotting data points, as the scale on this graph is quite large. So be sure to prompt them to pay attention to the exact spot where the data goes. The activity asks them to draw the straightest line possible. This line will then be extended down to the x-axis to approximately -270°. If students do not accurately plot these three data points, than their line will not extend far enough out to the left. I encourage all of my students to use a straight edge (ruler) when making these lines. When looking at the three temperature scales, take a moment first to compare the relationship between Fahrenheit and Celsius. In this unit of study I have left out a lesson on converting between Fahrenheit and Celsius. You could insert that lesson prior to teaching this lesson on absolute zero. In my classroom we do not use the Fahrenheit scale much, and if necessary I allow students to use computer conversions rather than teaching them the formula. Please choose the method of instruction that best suit your needs. Both of which are simple enough for 8th graders to work with. Can the volume of a gas be negative? Why or why not? What is the lowest temperature that you think can be reached on the Celsius scale? Explain your thinking. Do you think it is possible for a substance to reach absolute zero? Why or why not? What might be the advantages of the Kelvin scale? If your students have not been exposed to the Kelvin scale before, this is the time to talk about its usefulness. Ask your students to think about where this scale would be useful and how the Celsius and Fahrenheit scales are limited due to the range of temperatures on these respective scales. Think about parts of your curriculum where students will find the Kelvin scale useful, such as lessons in astronomy (stars, Jovian planets, etc) and Earth science (layers of the earth) in order to make the connection of why we're studying the scales. In part two of the activity you will need to navigate to the PhET Gas Properties simulation. If this is your first time using one of the PhET simulations, make sure to give yourself time to play around and learn how it works before teaching this lesson. One thing to note when demonstrating this to your class is in the upper right-hand corner of the simulation screen you have the option to lock one of the parameters - either volume, temperature, pressure, or none. You want to click the radio button next to volume. This will keep the size of the container fixed throughout the sim. Students might ask about the tiny man to the left of the container. I explained to them that when they run the simulation the tiny man can adjust the size of the container automatically depending on the interaction of temperature and pressure. As mentioned in The Getting Started section of this lesson, you may opt to teach this lesson with students working in pairs at computers. Something to note here, is that these simulations can be looked upon like video games so students will want to play around with them before actually finding their usefulness of them. I have found it to be good practice to give students time to play with the sim before staring the lesson. I explicitly gave them a chance to poke around and check out all the features. The simulator gives you two option for particles, light ones (red) or heavy ones (blue). When you are ready to begin, select 15 to 20 heavy species molecules to pump into the container. Ask your students to choose one of the molecules and focus on its behavior for a minute or two. As they are making their observations let them know that you want them to come up with at least four characteristics they notice of the molecules as they move inside the container. These include behaviors such as straight-line movement, changes in speed, more empty space than molecules, collisions with each other and the sides of the container. Next, adjust the temperature by moving the slider up or down (located directly below the container). You will see either ice cubes or flames appear when heating or cooling the container. My students get very excited at this point and of course want me to make the container as hot as I can or cool it down to zero -- which I gladly oblige. Have students share what they notice about the behavior of the molecules when heated and cooled. This might be review, but this visualization helps students further understand the kinetic theory of molecular movement. 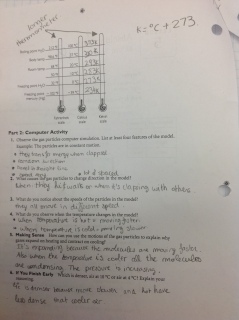 When you're finished running the simulation have the students answer the follow-up questions on their worksheet. Describe the motions of the gas particles. What happens to the gas particles as they are heated? If the container walls were flexible, what would happen? How can you explain the change in volume of a gas that is heated or cooled, in terms of the motions of particles? What do you think would happen to the motions of the gas particles if you could cool a gas to 0 K? If you follow the sequence of lessons outlined in this entire unit you should find connections back to prior learning after completing this activity. The Kelvin scale assigns a value of zero to the temperature of a gas with a hypothetical volume of zero. Conversion between the Celsius scale and the Kelvin scale is given by the formula K 5 °C 1 273. Gas particles are in constant motion. The average speed of gas particles increases as the temperature increases. The volume of a gas changes as the temperature changes, if the gas is in a flexible container. While this lesson does not involve direct hands-on interaction with manipulatives and lab materials I do find that students really enjoy the simulation and look forward to the opportunity to get to interact with the software. Of course you could opt to make this more hands-on by actually having been used to simulation on a computer.